The first time I experienced the beauty of homemade pasta, it was served to me in flat, clean strips of thin fettuccine tossed lightly with pesto and juicy cherry tomatoes– a simple and fresh rendition that allowed the strands to shine through. I was hooked on the delightfully light taste and airy chew and honored that my friend would make such a vast, flour-dusted mess of his kitchen in a small San Francisco apartment merely to create a meal for me. He insisted that the non-boxed taste always made the mess worthwhile. I found myself with a similar mess a few years later while looking to hook the Cute Gardener inches deeper into my web with a special meal of homemade butternut squash ravioli in sage brown butter for Valentine’s Day. My attempt at mastering the basic egg “well” (which is elemental in good pasta dough-making) was disastrous, turning a neat hill of flour into a mountain ridge complete with overflowing rivers on my counters. Needless to say, as much as I started to mention how much I loved fresh pasta, and to tell the CG endlessly that we needed to get a pasta roller, I was secretly intimidated by ever undertaking the daunting task again myself. But when you eat as much pasta as we do, it started to seem ridiculous that one whole cabinet in our pantry was devoted to box upon box of dried pasta in every shape and form. For such true pasta aficionados, it was verging on sacrilegious that we didn’t attempt to create our own fresh batches at least every once in while. So this past Christmas in exchange for my gift of a long-drooled after cherry red Le Creuset Dutch oven, I bought the CG a KitchenAid pasta maker. 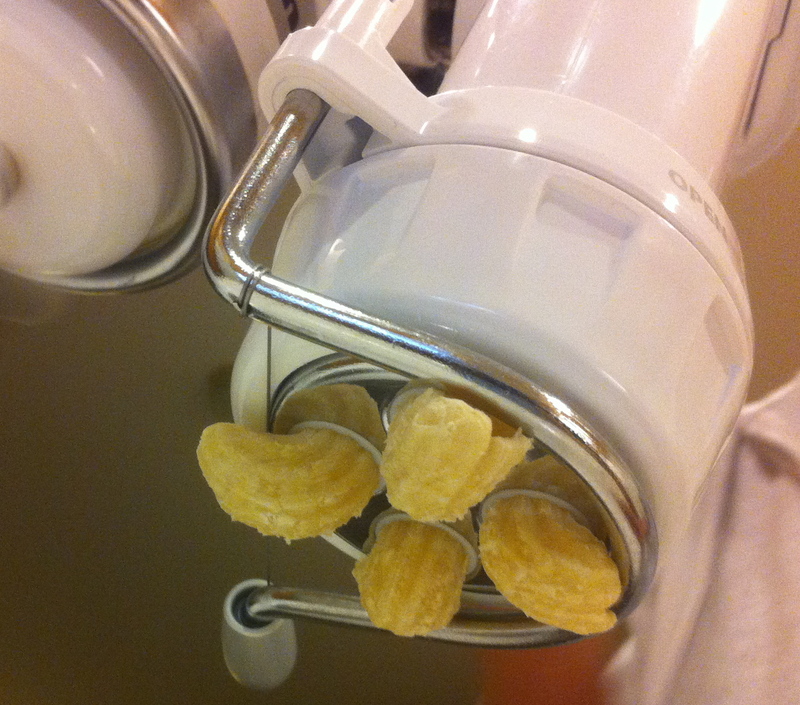 Unlike regular pasta rollers this came as an attachment to place right onto a traditional stand mixer in which dough could be pushed through to create various shapes of pasta depending on which plate you have affixed. I have long been afraid of convoluted food machinery, mostly because I have a hard time reading and following rules and get overwhelmed by parts and pieces that require assembly, usage and proper cleaning. But cooking with the CG has opened up this side of me to realize half the battle lies in understanding what you are doing and the rest unfolds like clockwork. This machine couldn’t have been easier. 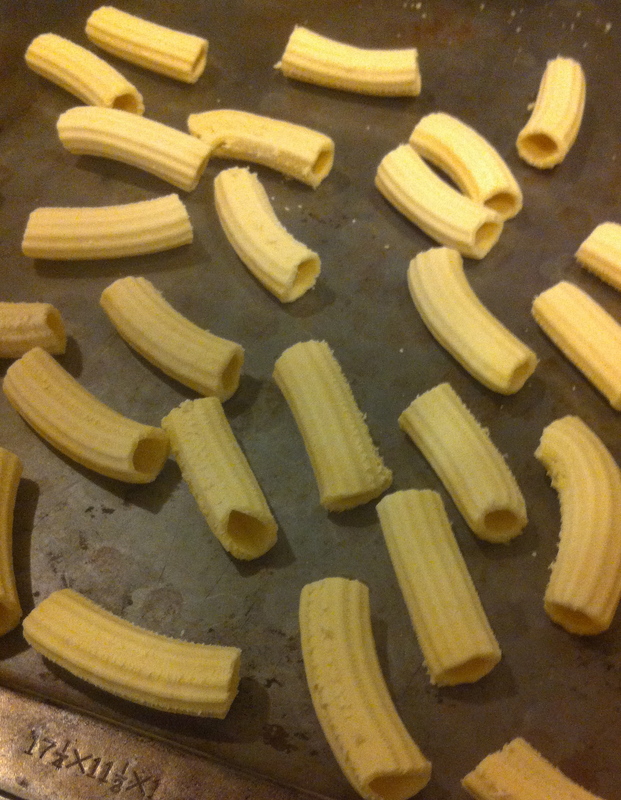 Once we followed instructions in the accompanying book to make the crumbly, stiff dough, it was easy to feed through the cranking machine and fun to watch the rigatoni form. Within minutes we had a pound of beautifully dense, ridged tubes. 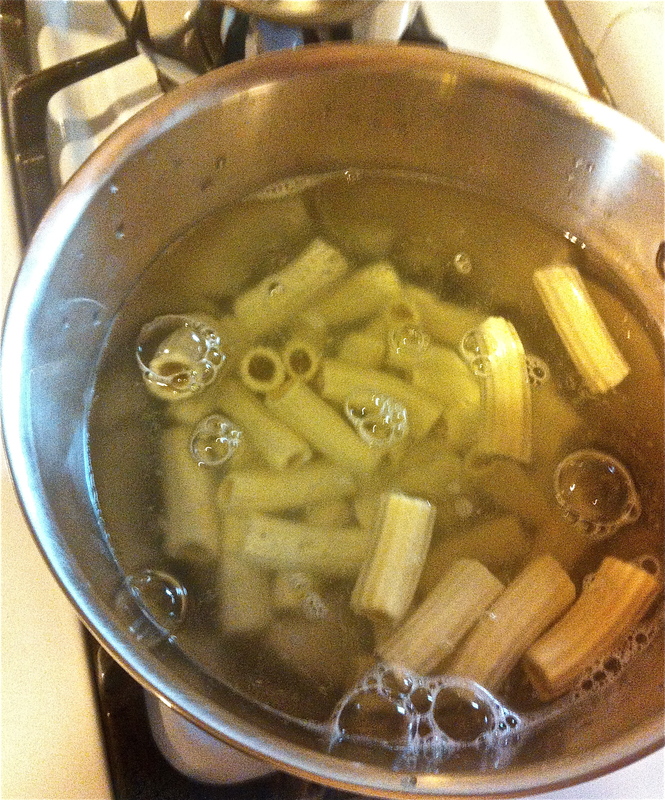 Within six minutes in boiling water, our pasta was done. 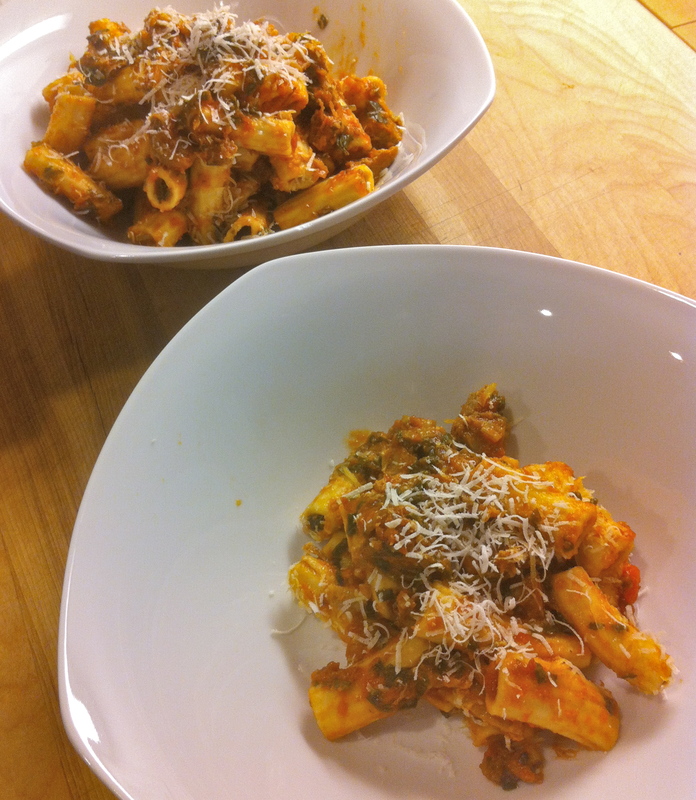 We tumbled the rigatoni into leftover tomato sauce with chunks of tender pork. It was delicious: the ridges were firm enough to gather bits of herb, the bite of the pasta was strong yet pliant and the taste was better that something similar out of a box. I am itching to make new pasta dishes every week now from macaroni and cheese to spaghetti Bolognese to an old school ragu – that is if the CG will allow me; up until now he’s been the pasta king of the kitchen but this new machine is inspiring new hankerings within me to add more Italian to my repertoire. 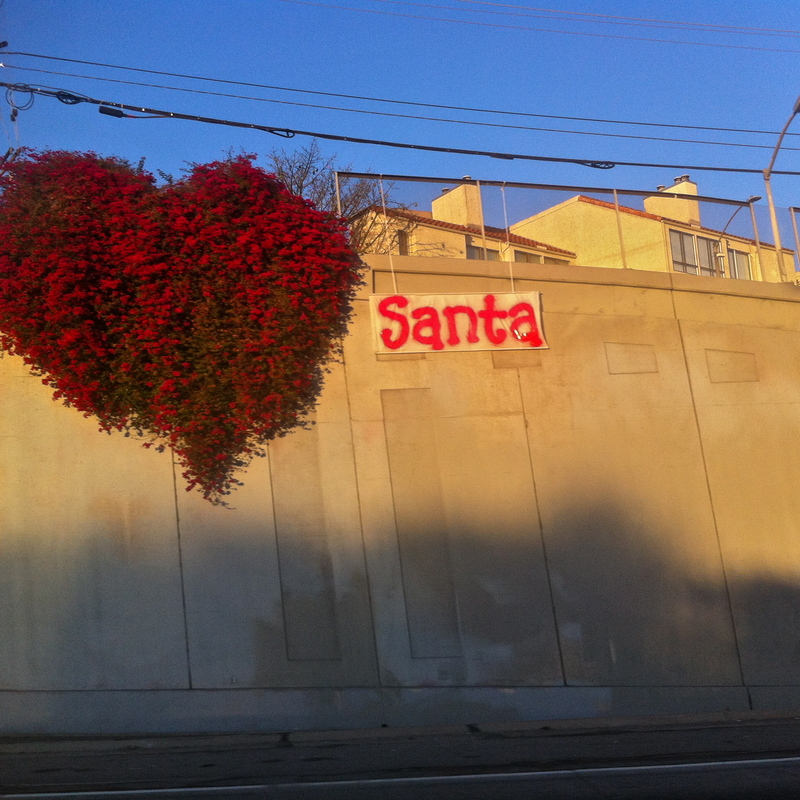 On a Sunday morning of late, the Cute Gardener and I found our selves strolling around a strip mall in a seedy section of North Hollywood in the breakfast hours awaiting a plate of ajarski. We had ventured to Sis Bakery seeking the Georgian-originated, Armenian dish lovingly coined “breakfast in a boat” and were told that because the dough was made to order and super fresh it would take a half hour to cook. Being the egg and bread whores that we are, we agreed to wait, and spent the next thirty minutes sampling a dense and juicy baklava square from the bakery next door, shoring up on Lebanese almond and rum cookies, scouring the shelves of the corner liquor store for discount bottles of good Kahlua and whiskey and perusing the grocery to marvel over cheap, bulk bags of colorful lentils and multiple varieties of feta. 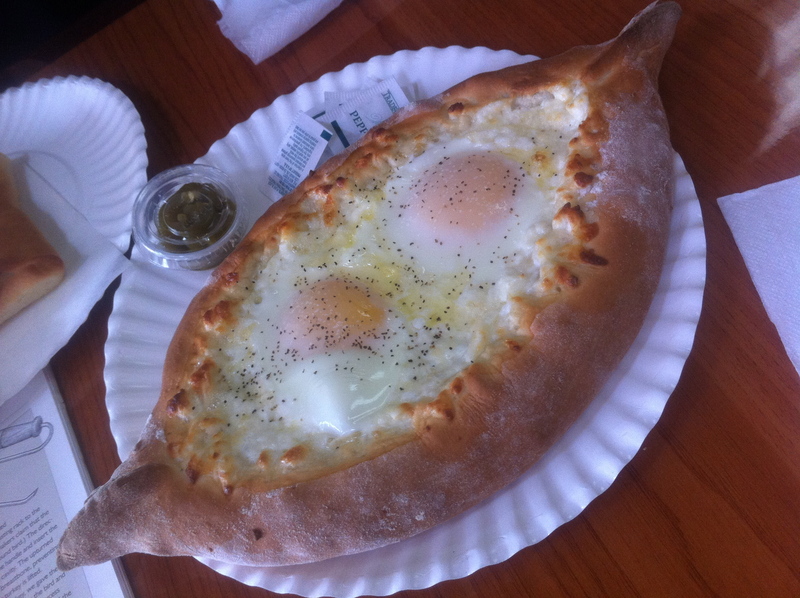 When we finally sat down to eat what looked like an open-faced calzone floating with two heartily peppered and golden, wet eggs over melted cheese, we were ravenous. I am pretty sure if I were forced to choose a cuisine that I was limited to for the rest of my life it would be Middle Eastern. There is something about the food in that cradle of the world that rocks Armenia, Turkey, Lebanon, Iraq and Iran that calls distinctly to my palette; most specifically the dates and pomegranates, musky meats, spices of cardamom, dill, chives and all the mellow cheeses that teeter between creamy when crumbled and curdled tart into spreadable yogurts. I love how roasted red pepper makes its way into many dishes and also the appearance of nuts, grains, lentils and lemon that don both savory and sweet incarnations. 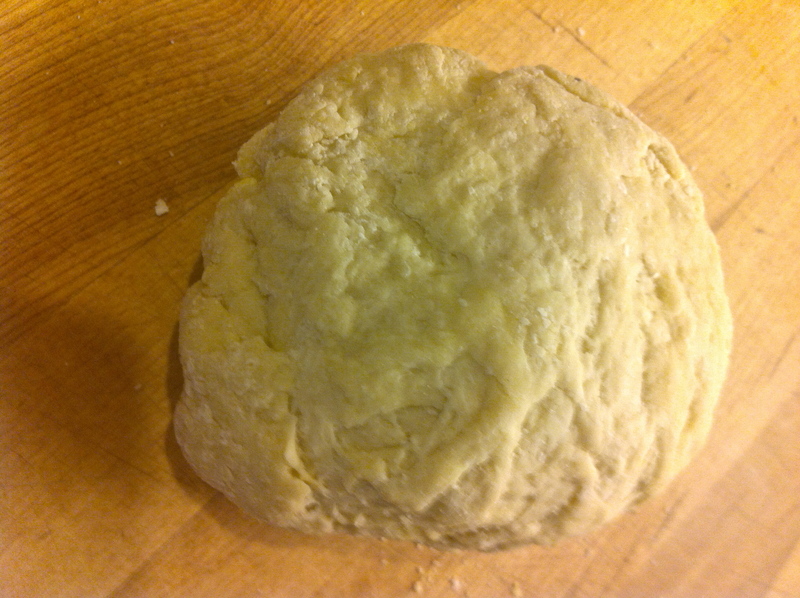 But I have yet to delve into the types of bread that are common to the region aside from the readily available flat lavosh style sheets that I tend to buy, stuff and roll into wraps with a decidedly Mediterranean whimsy. As we sat at the one table in the small and extremely warm bakery to eat our novel egg dish for a scanty five bucks with two plastic forks, I was enticed to learn more about this dough that seemed to make up for all the offerings in the bakery that day. We had it as boreks, wrapped around cheese and chives in generous pockets for a mere $2.50 and saw it also house innards like beef. I could easily see myself remembering this place as an alternative to fast food on the road but what I really wanted to do was learn to make the bread at home, only perhaps just a tad bit more flavorful, so that I could create these concoctions myself for everyday eating. 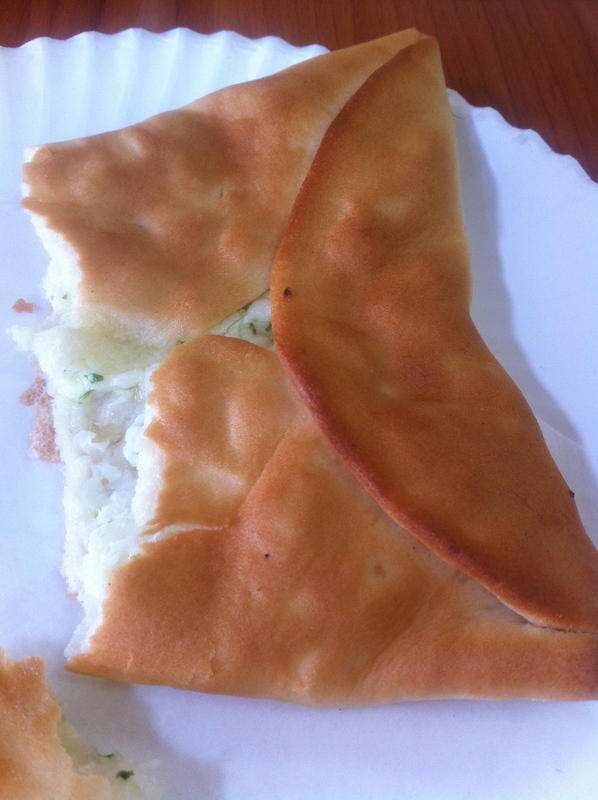 What I learned is that bread is a basic staple called khachapuri, which is leavened and allowed to rise and then shaped in various ways. I found a simple recipe for it here, which reveals yet another grand use, as a carrier pastry for marvelous minced pork filled meat pies. Although the ajarski dish we tried was rather plain compared to others I have since seen showcased around the Internet, I am happy to have discovered it in such a small, family owned hole-in-the-wall space. I may give it one more go if I ever get to Red Top Burger in Glendale only perhaps topped as well with jalapenos and bits of bacon. When ex-registered nurse Tricia Wong was at the wit’s end of battling her lifelong asthma and in a severe sense of depression, she turned towards listening to motivational speakers like Tony Robbins to help her get by. One day she decided to listen to the message she heard woven through the bottom line of all these inspirational leaders, which was to find something she had ultimate passion for and follow it through. 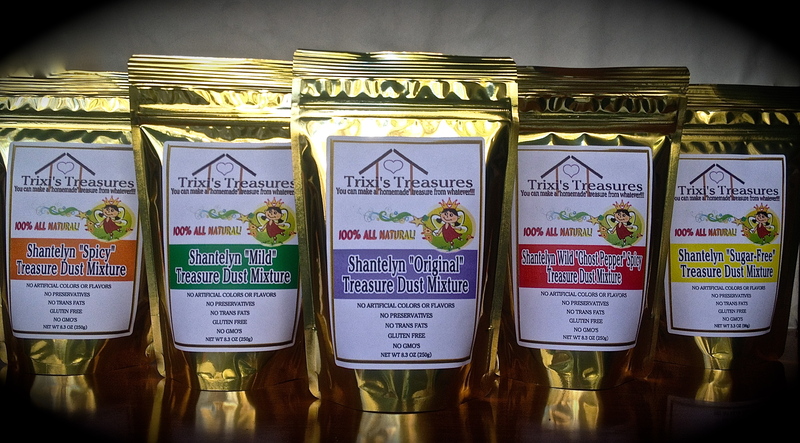 This is when she became an entrepreneur and began the snack food company Trixi’s Treasures with the help of her aunt – a small boutique business that specializes in “Shantelyn Treasure Dust Mixes” for a bevy of customizable snack blends. The Treasure Dust mixture is a 100% all natural powder mixture that you cook with a cup of oil or butter and then pour onto your favorite nosh goodies in a Chex Mix-like fashion: for example, a combination of cheese curls, cheerios, pretzels, peanuts, dried fruits, etc. What results is a strangely magical blend of sweet, salty and savory that is confounding in its ability to be equally addictive on a cheese coated item as it is on a sugar coated one. I have not been a purveyor of boxed and bagged snacks in my adult life only because I overdosed on Cheez-Its alongside my mom on the lounge chair in the backyard of my youth where we used to tan and munch with trashy magazines on Saturdays. I binge on a bag of Doritos three or four times a year and blame it on college football season and consider that a dirty little secret. So, when I received my box of Trixi’s Treasures in the mail to sample, I was sure I would be as unaffected by them as I am by the Cute Gardener’s perpetual stock of buttery appetizer crackers or Planter’s nuts under the coffee table. Instead of sending me the mixes, they sent me bags of specialty snack blends packaged up like regular bags of chips that covered the original blend of Treasure Dust all the way through more daring versions like a jalapeno, spicy variety and a berry version. It only took a few weeks to dust off four of the highly-addictive bags that truly seemed like treasures in all the different things I would uncover in each bag: toasted rice or corn cereal squares might crawl up from the bottom of one while roasted green peas might swim in another while rye or baguette chip slices might emerge in the last. And the “dust” coating in itself – definitely a winner for those who a have a sweet tooth. It makes these snacks hard to put down, definitely difficult to not finish in one seating once you start. You can buy your own dust or order your own customizable snack blends online. Otherwise, you’d have to find the ladies at a country fair, which they tour with relish.